If you're always on the go (like me), you'll love this easy 3 ingredient breakfast for mornings you need to get out the door in a hurry. All this recipe takes is a little prep the night before and you're set for the week! pairs well with freshly brewed coffee! For the wheat berries: the night before, in a small/medium sauce pot, bring 2 cups of water to a boil. Add in 1 cup of dry wheat berries and turn the water down to a simmer. Let these cook until the berries are soft and most of the water has been absorbed. The next morning, top your yogurt with the cold berries and add a squeeze of lemon. Posted on July 1, 2015 by Caroline Sossaman and filed under Breakfast, Recipe and tagged recipe White Sonora Wheat Berries 2015. Happy Mother's Day! What better way to celebrate your mother than by making some delicious pancakes for brunch? In a bowl, whisk together flour, baking soda, salt, and sugar. In a separate bowl, whisk together milk, eggs, vanilla, butter, and lemon juice. Once the wet ingredients are smooth, add the dry ingredients. With a spatula, slowly fold together the wet and dry ingredients; add lemon zest and poppy seeds (add in muddled raspberries if you wish). Set griddle/skillet to medium heat and choose a desired scoop size. Place the finished pancakes on a warm plate in a 200 oven until you have enough to begin serving. Top with your favorite fresh fruit, honey/syrup, edible flower garnish, or powdered sugar and enjoy! Grace Marie loved these pancakes so much she couldn't stay away from the photo shoot! Posted on April 27, 2015 by Caroline Sossaman and filed under Recipe, Breakfast and tagged 2015. Purple barley is one of the new and exciting varieties of grain we're growing this year...so of course we had to experiment! The barley has a light but distinct flavor that will make you want to bake it into everything! These scones are perfect on their own or with a spoonful of jam & homemade whipped cream. these scones turned out more blueish green than purple...but I think this just adds to the uniqueness! whisk together egg, milk, and vanilla extract. set aside. this dough gets pretty dark once you add liquid to it...but don't worry, they still taste amazing! Posted on April 6, 2015 by Caroline Sossaman and filed under Recipe, Dessert, Breakfast and tagged 2015 recipe scone All Purpose White Sonora Flour. These scones are the closest we could get to High Tea with the Queen...Pair them with your favorite jam and Devonshire cream (and tea, of course)for the ultimate experience. 1 - whisk together flour, sugar, salt, and baking powder into a large bowl. in a stand mixer or by hand, scrape in the butter (chilled, cut into cubes) into the dry ingredients until the butter is pea sized and the mixture is almost grainy. 2 - add dried currants to the butter and flour mix. 3 - in a separate bowl, whisk together eggs, milk, and vanilla. slowly add this mixture to the dry ingredients and mix until doughy. 4 - preheat oven to 420 degrees. 5 - dust flour onto a flat surface to roll out your scone dough (just enough so that it doesn't stick). knead the dough ball a few times but don't overwork it. roll out the dough until it is about 3/4 inch thick. 6 - cut the dough into 2 1/2 inch rounds (you can use a biscuit cutter or any circle cookie cutter of the approximate size) and place onto baking sheet (it is best to use parchment paper). note: place baking sheet of scones into the refrigerator for at least 15 minutes before baking. 7 - place scones into 420 degree oven and turn heat down to 400. bake for 10 minutes, until puffy and almost golden. cool on rack, serve with jam and heavy whipped cream, and enjoy! Posted on October 26, 2014 by Caroline Sossaman and filed under Recipe, Breakfast, Dessert and tagged All Purpose White Sonora Flour 2014. Here's a simple way to modify our pancake mix. 2. In an oven proof skillet add 1 TBS butter, sauté pears (and optional ham). Add the pancake mixture to the cast iron skillet, stir to mix. Arrange the slices of brie on top of the batter. 3. Bake for about 25 minutes or until done. Turn oven to broil, sprinkle top of pancake with cinnamon and sugar, broil until brie is bubbly. Serve drizzled with warm maple syrup. 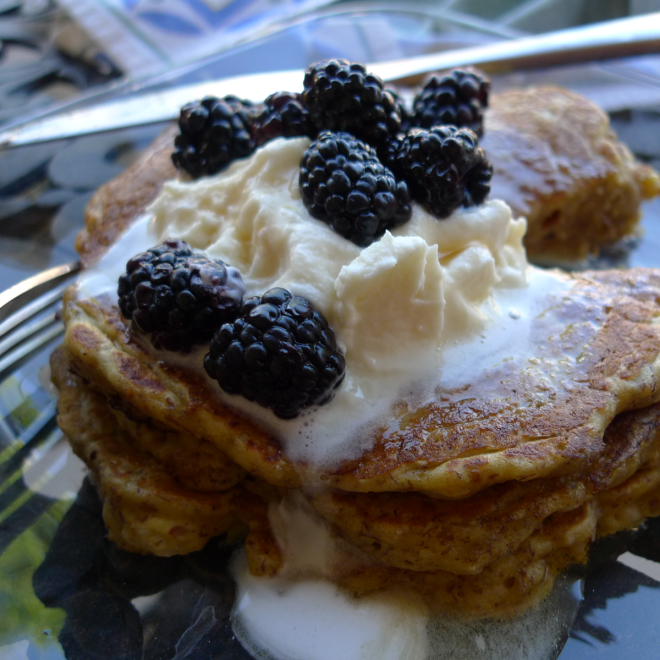 Posted on October 4, 2013 by Emma Zimmerman and filed under Breakfast, Recipe and tagged All Purpose White Sonora Flour Pancake Mix 2013. ...with whipped mascarpone. And maple syrup. AND berries. 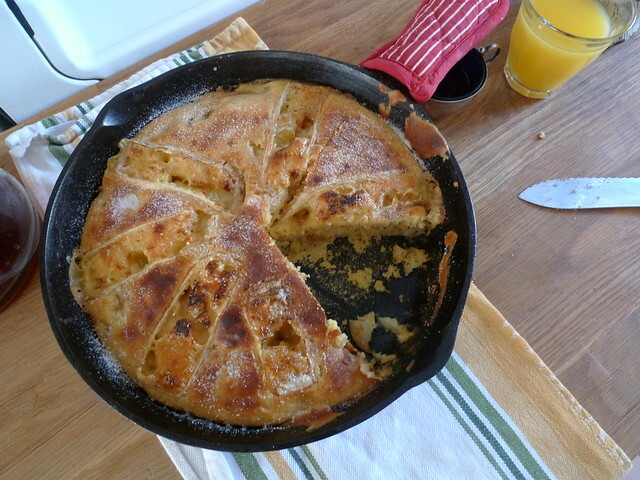 My mother invented this pancake to feed a hungry track team one morning. This recipe is award winning. And the track team went on to take 2nd in state. What else can I say. Did I mention that my mother is a registered dietician? So they are good for you too. 1. Fig Oatmeal. If you are using Coach’s oats bring 3 cups water to a boil and a 1 cup oats. Reduce the heat and cook for 5 minutes. Near the end stir in the figs and cook for another minute. For other types of oats follow a 1 cup oats to 2 cup water ratio. 2. Sift the dry ingredients together in a bowl. In a separate bowl, whisk together the butter, soy milk, honey and eggs. Combine the wet mixture, dry mixture and fig oatmeal, gently folding it all together. If you think the batter looks a little thicker than your normal pancake batter, that good. It’s exactly right. 3. Heat your cast-iron skillet. When it’s hot enough, coat the skillet with butter. Drop a few ¼ cup servings of batter in the pan, wait for bubbles and flip pancakes. Cook on the other side for another 3 minutes. Continue to re-butter the pan as you go along. 4. To make the whipped mascarpone, simply whip mascarpone and powedered sugar with a hand mixer until it forms stiff peaks. Stack the pancakes up and serve hot with a dollop of whipped mascarpone, a few berries and a generous pour of maple syrup. Posted on May 16, 2012 by Emma and filed under Breakfast, Recipe and tagged Pancake Mix All Purpose White Sonora Flour 2012. When you break corn down into its parts you get flint (the hard glassy bits), startch (the white floury part), germ (good oils and fats), and the outer pericarp (good for chickens). So depending on how we sift the corn when we mill it, we can get cornflour, cornmeal, polenta, or coarse grits. Nothing gets wasted. It's all about how fine the screens are and how close the stones are set together. Corn is incredibly versatile. And we haven't even started talking about color and cob patterns. 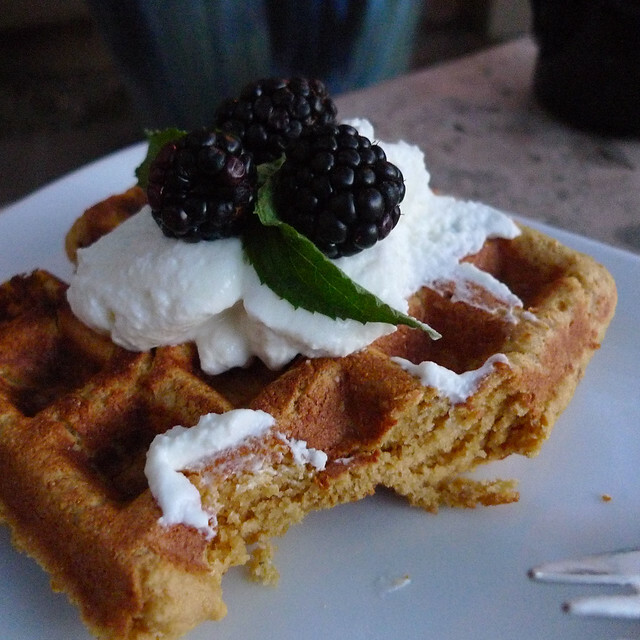 So here's just one idea on how to use cornflour--waffles. Perfect for a lazy Sunday morning. If you want to include more whole grains in your cooking, then this cookbook is required reading: Kim Boyce's Good to the Grain. Although she uses some pretty obscure grains, even for a miller's daughter, most of the recipes can be modified and it gets you thinking outside of the all-purpose-flour-box. 1. Turn the waffle iron on. Then sift the dry ingredients into a large bowl. Don’t skip the sifting like you normally do. Think fluffy waffles! 2. In a smaller bowl, whisk all the wet ingredients together. 3. Pour the wet mixture into the dry, using a spatula to gently fold it all together. The batter should be fluffy, but thicker than a normal waffle batter. Posted on April 20, 2012 by Emma and filed under Breakfast, Recipe and tagged Corn Flour All Purpose White Sonora Flour Wheat Germ 2012.